The idea of motoring to the top of Pikes Peak took on an entirely different meaning in 1916 when Spencer Penrose created the Pikes Peak International Hill Climb. He created the race to generate nationwide excitement about the new road he just completed to the summit of Pikes Peak – the Pikes Peak Highway. Also known as the “Race to the Clouds,” the Pikes Peak International Hill Climb is the nation’s highest auto race, second in age only to the Indy 500. The race is held midsummer each year and attracts top racers from around the world. Starting at approximately Mile Marker 7 (just past Crystal Reservoir), drivers take turns speeding to the summit through a dazzling array of 156 turns, and an elevation gain of almost 5,000 feet. Winners are chosen for each of an incredible assortment of vehicle types including stock cars, sprint cars, SUVs, dune buggies, motorcycles, and even the cabs off the big-rig 18-wheelers. 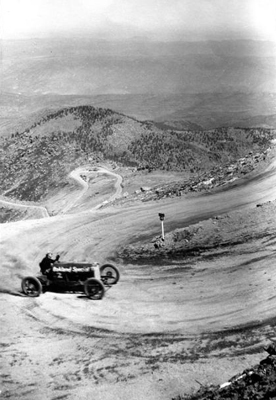 For most of the race’s history, the Pikes Peak Highway was a gravel and dirt road to the summit. However, a Sierra Club lawsuit forced the City of Colorado Springs to pave the entire highway. Paving was completed in 2011. The fastest time up the mountain is just over 8 minutes. This time may not be very impressive to those who have not yet made the trip to the top, but as you continue up the highway, you’ll surely change your mind as you near the summit.